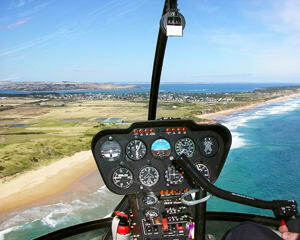 Imagine flying in a helicopter over beautiful Phillip Island, and taking in the unforgettable scenery and splendour this part of the world has to offer. Imagine flying in a helicopter over beautiful Phillip Island, and taking in the unforgettable scenery and splendour this part of the world has to offer. Helicopter scenic flights are exciting, inspiring and awesome! We leave the airport tracking coastal passing Smiths beach, Surfers Point and Cunningham Bay with spectacular views of the Grand Prix track. Flying overland to Berrys Reef, flying past Kitty Miller Bay and Summerland Beach, home to the Fairy Penguins, before arriving at seal rocks. You will then fly along the coast, with fantastic island views, back to the airport. This is a great introductory flight around the island, giving you a birds eye view of the gorgeous coastline. Departs Newhaven, Phillip Island. All flights are weather permitting & subject to change. The staff at Phillip Island Scenic Tours were sensational. They made the day awesome. Lucy the young pilot was fantastic even though she was young we felt totally safe. Loved it, it was a fantastic gift for my partner.